Prairie Dog (cynomys, Raf. ), a genus of American rodents, intermediate between the marmots and the spermophiles or prairie squirrels. The cheek pouches are very rudimentary; the eyes large, and the ears very short; five distinct claws on all the feet, those on the fore feet much the largest; the body thick and low, the feet large, and the tail short and thinly haired; the skull short and very broad, with the zygomata strongly convergent anteriorly; molars very large, arranged in curves, strongly divergent anteriorly, and near together behind. The common prairie dog (O. Ludovicianus, Ord) is about 13 in. long, with the tail 4 in. more; the color above is reddish or cinnamon brown, with lighter tips to the hairs and a few black ones intermixed; beneath, brownish white or yellow; tail like the back, with a black tip; in winter the color above is more grayish; the hind soles have a hairy patch. 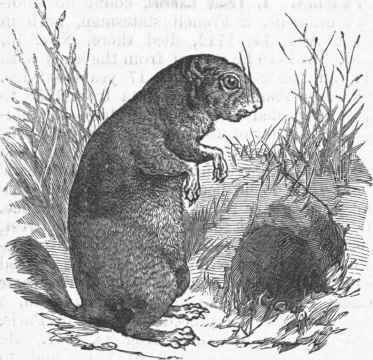 This woodchuck in miniature is abundant on the plains west of the Missouri river, extending as far north as the limits of the United States, and south to lat. 30° N.; it is confined to the prairies, and feeds on plants and occasionally on insects. Prairie dogs live in society, hundreds in the same district, their numerous burrows placed close together, and sometimes extending over a space of miles, meriting the common name of dog towns or villages; around the mouth of the burrows the earth is heaped up to a height of about 18 in., from the top of which the occupants can survey what is going on in the community; their burrows are so deep and extensive, that riding among them is often dangerous to horses' limbs; fond of standing erect at the mouth of their burrow, and rarely going a great distance from it, they retreat in a comical tumbling manner at the least sign of danger, after a short time peeping out again. They feed chiefly at night, are very shy, and when shot, unless killed outright, almost always manage to get into their holes; they are active, playful, very prolific, and from their habitat as yet not injurious to vegetation; their flesh is tender, fat, and juicy. In the northern districts they hibernate. The prairie dog was probably so named from the sharp tone of its chatter, somewhat resembling the yelp of a small dog, as it bears no' external resemblance to the dog; it is the petit chien of the French Canadians and the wishtonwisfi of the western Indians. Burrowing owls and rattlesnakes occupy the burrows with the prairie dogs. In regard to the snakes, Mr. Kendall, in his narrative of the Santa Fe expedition, says that the prairie dogs are " compelled to let them pass in and out without molestation." A smaller species (C. Columbianus, Ord), with a shorter tail, is found on the plains near the Columbia river; it is reddish above, with the tail edged and tipped with white.